Abbatiale de Tournus has been part of the Tentative list of France. I travelled around Burgundy in 2016 and I was a bit surprised how important a cultural and religious center this area was in the middle ages. The famous reform order of Cluny founded hundreds of monasteries in a short time. Its mother church was the largest church of Christendom for about 500 years. When the order go too powerful and rich some monks founded a new order in Citeaux which turned into the cistercians with probable several thousand of monasteries all over the world. Sadly enough the both mother churches were largely or completely destroyed. Cluny was used as a quarry and only a small part is saved but is still very impressive. For fans of romanesque architecture this area is a real paradise almost every village has a castle and often remarkable parish church. 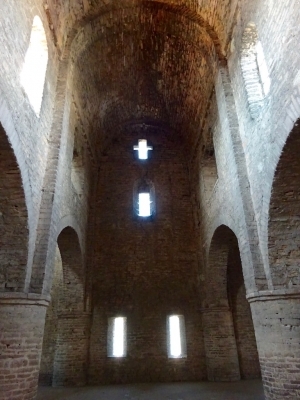 One of the most important and well conserved monasteries is definitively the early romanesque monastery of Tournus: St-Philibert. It is a bit younger then Cluny but a benedictine foundation. I was impressed by the castle like facade with two uneven towers. The west entrance of the church leads into a dark narthex with a low, heavy vault. Like the nave, it has three aisles. Above the narthex is the Chapel of St. Michael. A big three-naved plane room which seems even more spiritual though its plainness (picture). You can look up into the two towers with stairs in them but you cannot climb them. The chancel of the church is surrounded by a semicircular arched ambulatory as is typical for cluny churches. there are some beautiful mosaics of the Zodiac, a fascinating crypt and remarkable early romanesque murals and strange Giacometti-like elongated caryatids. Not far from tournus is the equally fascinating church of Paray-le-Monial which seems a small scale version of the Abbey of Cluny. Both monasteries might have been good WH-material had they been launched at the right time with the right arguments.